Custom Home Builders in Houston – What Does Alleanza Mean? Alleanza is an Italian word for Covenant. When you share your dreams and your plans with us, we will make promises and commitments to you that we take seriously. We stand by each of our custom built homes in Houston with a lifetime guarantee. This is our covenant – our promise - to you and your family. We will do what we say we’re going to do, and we’ll exceed your expectations every step of the way. We started as custom home builders in Houston in 2007. All our homes have been distinguished by their design, custom features, and high quality. Our company started during an inconvenient economic period for real estate, but we knew that custom built homes in Houston had potential, and we knew we were the best at what we do. When you provide high quality and outstanding customer service, people will always want to work with you. We’ve found that to be true, and by the end of 2017, we will have completed our 50th custom built home in Houston. We’re proud of that, and we’re even expanding into communities like West University, Memorial, and Lakeside. Our designs are unique, compared to other home builders in Houston. The architects we work with are talented and they design truly custom and high-end homes. Our reputation for doing what we say we will do and standing behind our work is well established. 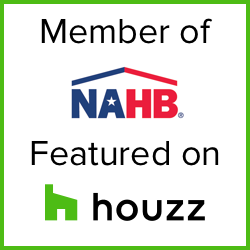 There’s a lot of credibility associated with our name and our ability to create custom built homes in Houston. We’ve been doing this for 10 years, and people know we can be trusted. Our process is seamless for the future homeowner. We make it fun and managed and predictable. We are constantly communicating with you, your architect, and the entire construction team. Everything is transparent and predictable and the end result is exactly what you envisioned when we first started talking about your dream home.